JustLeadershipUSA (JLUSA) is dedicated to cutting the US correctional population in half by 2030. JLUSA empowers people most affected by incarceration to drive policy reform. JLUSA believes that America’s most challenging barrier to expansive, systemic criminal and juvenile justice reform is the absence of clear and consistent leadership by those who have been directly affected by our failed criminal justice policies. Through our Emerging Leaders trainings and our 12-month Leading with Conviction training, JLUSA is building a nationwide network of advocates and organizers united by a shared vision for justice reform. Emerging leaders are highly motivated individuals with a strong commitment to making a real difference in their community of choice. Typically, they are just stepping into their role as organizational and/or community leaders and must simultaneously juggle their professional development needs with their desire to make real change. Our regional Emerging Leaders trainings are professional sessions with a skilled facilitator and a dynamic and participatory agenda. All Emerging Leaders participants must have prior involvement with the criminal justice system (juvenile and/or criminal justice involvement is required to be eligible and includes but is not limited to: actual incarceration [served time in jail and/or prison], arrest with or without conviction, under community supervision, i.e. parole, sentenced to probation-only, and involvement as a client in the juvenile justice system). Deadline to register is October 7th. Click here to register. Are members, employees or clients in-good-standing with a regional partnership organization. Have a demonstrated track record of leadership within their community. Are committed to ongoing leadership development and expansion beyond the emerging leadership training itself. Are committed to systemic criminal and juvenile justice reform. Have at least one year from date of release of previous incarceration so as to be able to take full advantage of JLUSA’s investment in their leadership development. Communication skills – learning how to connect communication with real results. Professional relationship effectiveness – managing up, down or any direction; leaders must communicate effectively to be successful. Interviewing and employment skills – emerging leaders are challenged to learn skills essential to securing and sustaining employment. 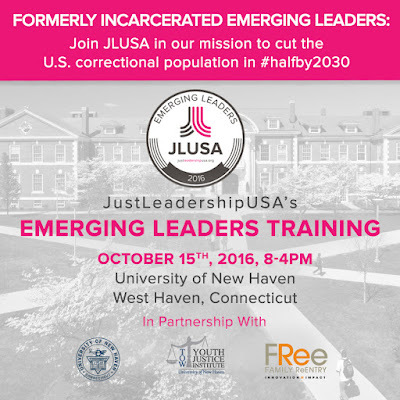 JLUSA seeks to train individuals connected to re-entry organizations in the West Haven, CT area who are committed to the professional development of emerging leaders. Individuals should seek a referral from a partner organization before registering for Emerging Leaders. Deadline to register is October 7th. Click here to register. Deadline to register is October 7th. Click here to register.